At last, a cookbook to take me back to meals I savoured in family-owned restaurants while visiting the Greek Islands. Occasionally one finds a Greek restaurant that touches on some of the authentic flavours, ingredients and moods of Greek feasting- and yes, the ouzo helps. However, my cookbook shelf has held a hopeful space for a book that would allow me to recreate those dishes at home. 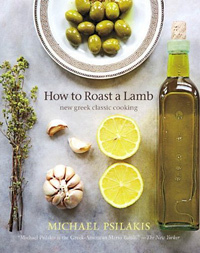 It was with great satisfaction that I flipped through Michael Psilakis’ How to Roast a Lamb. This is not a cookbook filled with cliché dishes of our version of Greek cuisine, but true Greek cuisine by a chef with both skill and passion. Psilakis shares his story of an upbringing centred on family rituals and food. His parents are Greek immigrants who bring with them their traditions and flavours from their homeland passing them on to their hungry and willing children. Psilakis grew into a chef and restaurateur not through schooling but through hard work and keeping close to his roots. His journey and tale is as engaging and warm as the dishes he creates. The dishes are classic Greek with some new twists. The latter section titles ‘Anthos – the new world’, features more complex and innovative dishes Psilakis showcases at his Manhattan restaurant Anthos. Such dishes as Braised Lamb Pastitsio, Anthos Shellfish Youvetsi and Smoked Octopus with Fennel Puree, Lemon Confit & Pickled Vegetables are neither for the faint of heart nor uninitiated with lists of ingredients and steps to fill an entire weekend. Fear not though home cooks, the rest of the book is filled with family dishes that will at once inspire you to fill your kitchen with the enticing aromas of Greece. And, his recipe for Roasted Leg of Lamb with a stuffing of sun dried tomatoes, black olives, rosemary, mustard, garlic confit and yes, oregano, had me running to my local butcher shop. The photographs of the finished dishes are by our long-time favorite Christopher Hirsheimer with a few nostalgic family shots.